The artist satirizes the split in party loyalties between the Locofoco and Tammany factions of New York City Democrats. In particular he belittles the Irish immigrants widely recruited by the party at the time. The print may have apeared during the elections of 1836. 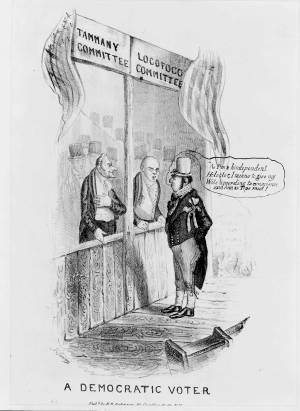 An Irishman stands on a platform before two booths, one marked "Tammany Committee" and the other "Locofoco Committee," and says, "As I'm a hindependent Helector, I means to give my Vote according to conscience and him as Tips most!" Beyond the platform is a crowd of voters, one holding a sign "Vote for Hoxie" (Joseph Hoxie, a prominent figure in New York Whig politics).